Easy, everyday elegance. Comfortable casuals with a cutting edge. Simple shapes, fine fabrics, soft tailoring and delicate distressing. All of these could be used to describe the “queen of Californian deconstruction”, aka Raquel Allegra. I am currently utterly obsessed with her eponymous clothing line. Maybe it’s because my mindset about what constitutes a functional wardrobe is changing (those work wear separates don’t mesh as well with the vision of my life as new mum! ), or maybe it’s because Raquel’s Californian pieces marry so well with our very similar Perth lifestyle and weather. Perhaps it’s that I love the effortless layering capabilities of her garments or perhaps it’s because everything is so beautifully made and whilst laid-back, carries an air of sophistication (flicking through the look-books, you just kind of want to be the Raquel Allegra girl). Whatever the reason, I can’t get enough of her designs, sourcing bargains madly on eBay and consignment sites. As per her website, “Raquel’s design career grew naturally with the origination of a shredding technique synonymous with the namesake label. 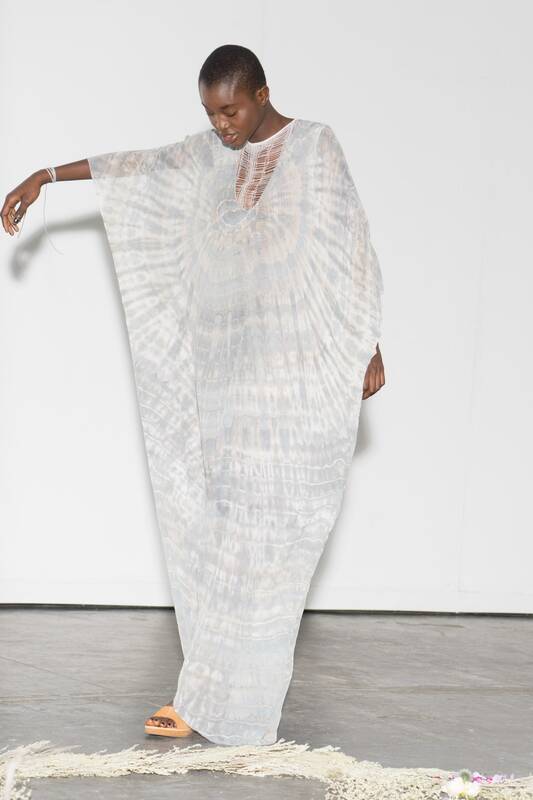 Full length webbed cocoon shapes evolved out of laborious experiments with oversized vintage t’s recycled from the Los Angeles County Prison System, and informed a new informal beauty within the industry”. She has become a darling with celebrities, stylists, fashion insiders and the everyday woman alike, simply because her garments represent that ‘off-duty’ chic to which everyone aspires. 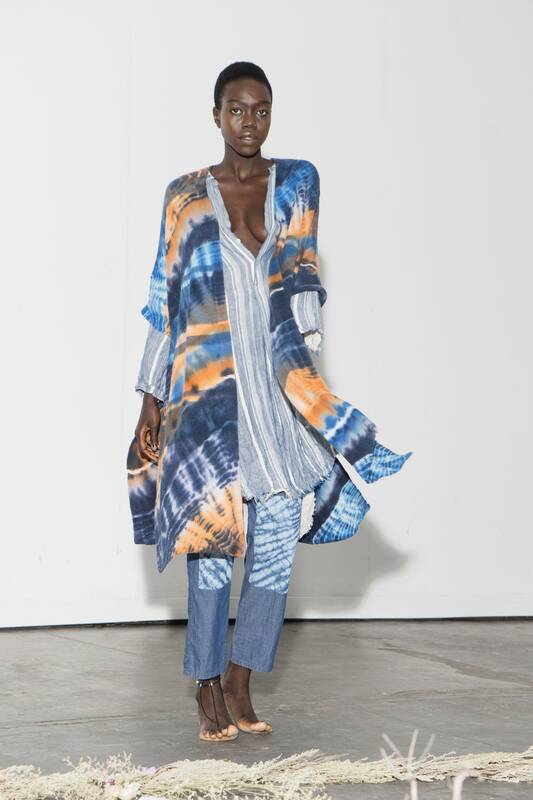 Her pieces can seem plain at first, but upon inspection, you will see the attention to detail in her (highly renowned and regarded) distressing, hand-printed patterns, special washes and beautiful fabrics. Raquel’s aesthetic has been described as “luxury with a side of slouchy bohemia” and I can think of no better descriptor! This soft lace pull-over from the Fall 2013 collection retailed for more than $550, yet I nabbed mine for only US$34!! This delicate sheer silk ‘Cosmic print’ blouse from the Spring 2014 collection retailed for US$540, but I only paid US$24 for mine!!! If you haven’t already fallen in love with this designer, I hope today’s post will open your eyes to the wonderful world of Raquel Allegra, where women of all ages and shapes can be comfortable and confident in luxurious, easy-to-wear, beautiful clothes. What a world to live in! This recent work outfit two items worn for the first time. I have had this Diane von Furstenberg ‘Cairo‘ dress for awhile now, having purchased it last year from David Jones reduced from $499 to $224 with an extra 40% (taking it down to approximately $134). It is an unlined, slip-on, super stretchy body-con dress in a black and olive pattern with contrast princess seams to create a streamlined shape. I paired it with one of my recent Bindaring buys, this exquisitely detailed cashmere cardigan from Sacai. For those who are unaware, the Sacai woman is avant-garde in her approach to dressing, preferring full and unusual silhouettes, daring shapes and conceptual pieces. She likes quirky and purposefully haphazard pieces that make a subtle statement in a sea of same. 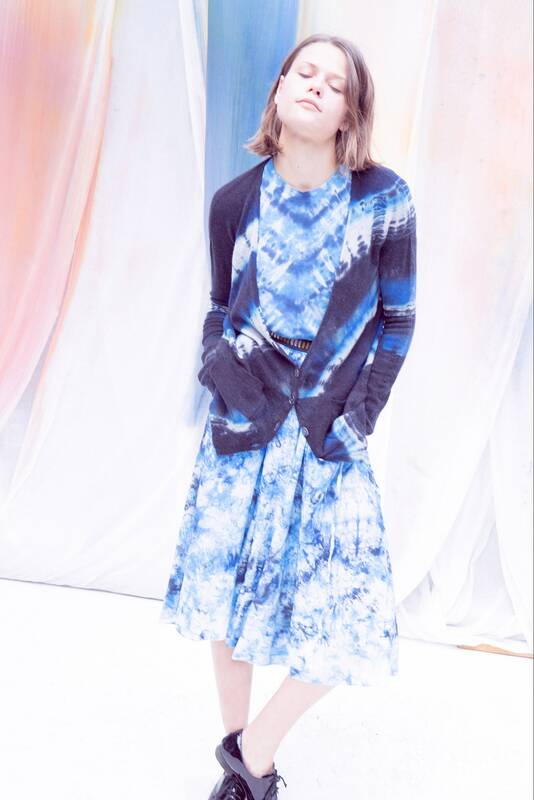 Designer Chitose Abe seems to adhere to the same school as fellow Japanese designers Rei Kawakubo, Issey Miyake and Junya Watanabe, but I find her aesthetic to be a little more restrained and tending more towards the feminine. Sacai garments are made in Japan from fine (and sometimes usual) fabrics, utilising interesting and unique detailing. This cardigan is no exception, featuring a silk chiffon peplum and silver eyelets around the waist. I thought it was the perfect foil to this dress, which needed more than a ‘plain black cardi’. Given now I am not wearing heels, anything that will elevate my outfit is welcome! In capturing some of the detail of the cardigan, you get the added bonus of extreme up-close of baby bump! This cardigan would have easily retailed for around the $1,000 mark: at Bindaring, I nabbed it for only $20. I paired it with opaque tights and suede smoking slippers with sparkle toe detail by Nu by Neo. I’m going to have to wear this dress a bit over the next few weeks – it won’t be much longer and I won’t be able to squeeze the bump into it!! The dress and the cardigan are no longer available to buy, but I am currently lusting after these gorgeous Sacai pieces (sadly, whilst on sale, not available to buy for $20) as the shapes are just so maternity friendly! !